Discount Sport Nutrition, DSN and SportSupplements.com takes your privacy seriously, and we want you to know how we collect, use, share and protect your information. Any questions regarding your privacy, please contact us via our “contact us” page before use of our site. We strive to be the best store for top bodybuilding sport nutrition supplements online and your privacy is always our concern. 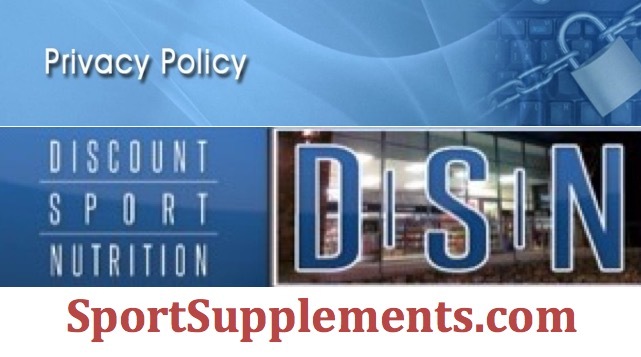 This Policy applies to SportSupplements.com, Discount Sport Nutrition (“DSN”) stores and other locations / websites / companies under the DSN name. We may post additional information if more details are needed to explain our privacy practices. Visit our contact us page for any questions you have for us. Again, we strive to be the best store for top bodybuilding sport nutrition supplements online and your privacy is always our concern. We receive and may store any information you enter on our websites or give to us in our stores. For example, we collect information from you when you place an order, create an account, call or email us with a question, join our DSN VIP keycard program at our retail stores, store information in your shopping cart, write a review, interact with us on social media sites such as Facebook or use of any of our services on our websites or in our stores. It may also include information you give us about other people, such as the name and address of a gift recipient, or the name and contact info of a Friends & Family person. One type of cookie may allow us to identify you as a particular Discount Sport Nutrition retail store customer when you visit our websites and to link your activities on our websites to your interactions with us in our stores. In combination with other information we collect, this cookie may facilitate the tailoring of advertisements and offers to you, sometimes in connection with interest-based advertising. Discount Sport Nutrition does not sell, rent or trade your personal information to third parties. We never have and we never will. Discount Sport Nutrition is the parent company of DSN, SportSupplements.com, Discount Sport Nutrition Franchising, L.P. and other DSN Companies ("Discount Sport Nutrition"), and as such, if you provide information to any of the businesses, stores or Web sites owned or operated by Discount Sport Nutrition, this information may be combined or shared among current or future Discount Sport Nutrition entities, including affiliates and subsidiaries. Sometimes we may be required to share personal information in response to a regulation, court order or subpoena. We may also share information when we believe it's necessary to comply with the law. We also may share information to respond to a government request or when we believe disclosure is necessary or appropriate to protect the rights, property or safety of Discount Sport Nutrition, our customers, or others; to prevent harm or loss; or in connection with an investigation of suspected or actual unlawful activity. We may share personal information in connection with financial products or services related to our business such as private label credit cards. We also may share personal information in connection with co-branded product or service offerings. Whether you are shopping online or in our stores, we use reasonable security measures to protect the confidentiality of personal information under our control and appropriately limit access to it. Discount Sport Nutrition cannot ensure or warrant the security of any information you transmit to us and you do so at your own risk. We use a variety of information security measures to protect your online transactions with us. The Discount Sport Nutrition Web site uses encryption technology, such as Secure Sockets Layer (SSL), to protect your personal information during data transport. SSL protects information you submit via our Web site such as ordering information including your name, address and credit card number. Information you provide to us via our in-store applications does not traverse the public Internet. Call us at 214-292-8619 with your request, full name, current contact information which includes your address, email and phone number on file with us.